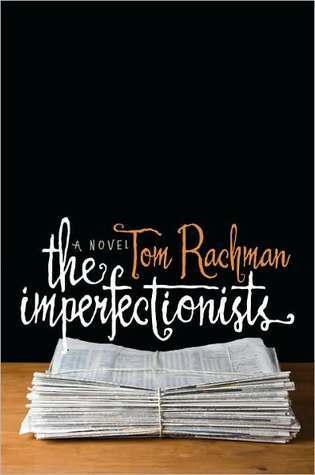 The Imperfectionists, the debut novel from Tom Rachman, follows the staff of an English newspaper based in the city of Rome. Each chapter focuses on one person integral to the publication of the paper - Lloyd Burko, the Paris correspondent desperate for relevance and a relationship with his son; Kathleen Solson, the editor-in-chief who discovers her husband is having an affair and contemplates one of her own; Winston Cheung, the inexperienced Cairo stringer who worries that his job has already been taken by someone more experienced; and Oliver Ott, the publisher who can never hope to fill the shoes of his grandfather who founded the newspaper. Together, these vignettes give the readers an intimate view into the everyday workings of a newspaper and the complicated lives of the employees who work there. There is also a lot to be found on these pages about the evolution of print media. We get snippets of the Ott family history and discover how and why Cyrus Ott founded this newspaper. As time passes, Rachman shows us how the newspaper changes and how it stays the same, much to its detriment. While I don't imagine that this story is indicative of all newspapers, it does make you think about the tremendous change we have experienced as readers in just the last 50 years or so. While everyone read and trusted the newspaper in the 1950s, few people turn to print media now as their main source of news. While each chapter focuses on just one character, you do find small glimpses into the history and relationships of other characters. When I closed the book, I felt like I could go back and immediately read it again to find new insight into the ways that these characters impact each other, both professionally and personally. Perhaps best of all, Rachman managed to surprise me again and again with twists of plot and character I didn't see coming. When that is done the right way, it's a lovely experience for a reader. The characters are brilliantly constructed. Each one has a very distinct voice and personality and you will find yourself invested in their lives in spite of (or perhaps because of) their very obvious flaws. As you start to read a chapter, you may find some characters unlikable, but Rachman is very skilled at peeling back the layers to show you the humanity of each of these people. By the end of their stories, you will be intrigued by them and care for them. The Imperfectionists is an excellent debut and it's easy to forget that it is, in fact, Mr. Rachman's first novel. He loves these broken, floundering characters so much that you can't help but do the same. When I finished this book, I had one of those rare, wonderful moments where I was sorry a book was over and so sad that there were no other books by this talented author for me to enjoy. This book is an exquisite look into our triumphs and failures as human beings. I read this book a few years ago and really enjoyed it--reflecting back on the days when journalism meant something, and substance was valued over soundbytes. But oh, that last chapter with the dog absolutely broke my heart. I think this book breaks your heart in all of the best ways. And that last chapter? That was an unexpected sucker punch. Life can be just that terrible and just that random. This one is going on my list! You're doing a fantastic job of testing me ;) I have a list of books to request when my ban is over! I've decided against this book in the past but your review is very convincing! I'm a sucker for well drawn characters. Now I'm curious about what made you decide against it. Did you read bad reviews or it's just not up your alley? What a beautiful review, Lindsey! I especially love this line: "He loves these broken, floundering characters so much that you can't help but do the same." That sounds like a book after my own heart. I'm adding it to my list. Thank you so much, Stephanie. I hope you enjoy it as much as I did! HI Lindsey, I really appreciate your coming to visit! Thanks to your lovely review, I now have this on my TBR. It sounds like a heartbreaker.